What next for British Talent Cup Champion Rory Skinner? It was a couple of teenagers, locks flowing from beneath their helmets, who gave the rain sodden fans at Valencia plenty to cheer about. Scotland’s Rory Skinner won the British Talent Cup, after one of the closest finishes in history - 0.001s - and Turkey’s Can Oncu made history by becoming the youngest-ever GP race winner and at his first attempt. But there was little in common between the two riders or the two races. The Talent Cup was, of course, all British. Moto3 had a lone Brit on the grid in the shape of John McPhee. Mostly they were from Spain or Italy with a few exceptions, Oncu being the outstanding one. It is a brave effort by MSV, Dorna and Honda to stage the British Talent Cup which has an all-in cost of around £2m but one has to ask where is it going? As Skinner and his father Mike drove out of the Ricardo Tormo circuit on Sunday they had no idea what they would be doing in 2019. Winning that championship does not guarantee you a step-up from where you are. For 17-year-old Skinner, riding the standard Honda but fettled by his dad, it was a much-needed confidence boost to a career which, however short, has promised much and delivered much but too often with difficulties. Introduced to mini-moto at the ripe old age of four, he was 12 when he first made people sit up and take notice by winning the 2013 Aprilia Superteen Championship final round at Donington, the youngest-ever rider. He was talent spotted at the end of 2014 by the Racing Steps Foundation - now sadly extinct - and placed in a team in the Spanish National Championship. It was a learning experience with some success and next year he was in the world championship with the same team on a KTM. 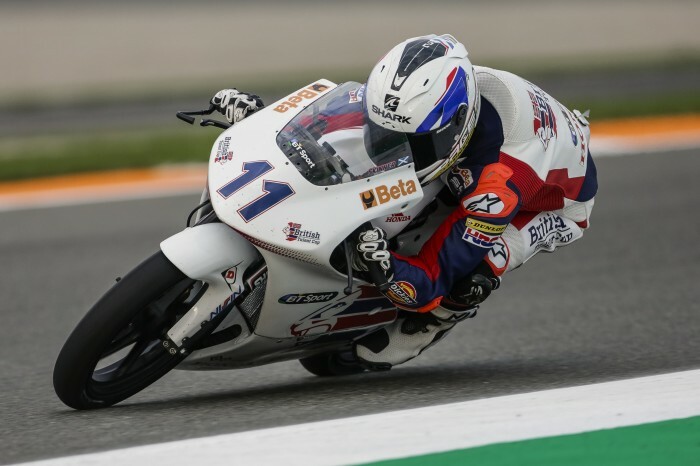 The next two seasons competing in the Red Bull MotoGP Rookies Cup were disappointing with bikes not as competitive as he would have liked contributing to more crashes than he needed. Father Mike explained: “It was an interesting time. The bikes were hard to learn but he was getting there. The second year saw tough competition but quite good results, finishing off the year with two podiums, pole position, lap record, at Aragon. But Rory never lost faith in his own ability: “Through the 2016/17 championships I was right up there with riders who are now very competitive in Moto3, and ahead of them. And I believe now I could do the same, it’s about having the right package around you. Mike, a former Perth motorcycle dealer and mechanic, who has invested a lot of both time and money in his son’s career: “We need an investor. We’ve had a lot of help from a lot of people, including Dorna, but at the moment we’re not certain of what is in store next year. We want to go forwards not backwards and winning this championship should surely mean something. The story of Can Oncu is a very different one from Rory’s. The 15-year-old twin - his brother Deniz was in the pits - became the youngest ever to win a Grand Prix, beating Scott Redding’s feat in the 125cc class at Donington by 55 days. He also became the first to win a world championship event at his first attempt since Noboru Ueda won the 125 race at the Japanese GP IN 1991. Before that it was Johnny Cecotto in 1976. Brought up in the Asia Talent Cup, he is this year’s Red Bull Rookies Champion. A Moto3 wildcard this year he is a definite for the 2019 Moto3 starting grid next. All credit to those behind the Talent Cup series which may well promote youngsters into domestic events but the number of Brits in MotoGP, Moto2 and Moto3 says it all. Good luck to Jake Dixon, Sam Lowes, John McPhee, Tom Booth-Amos and Cal Crutchlow.